Many student-drawn diagrams looked something like this. Image: Attari, Poinsatte-Jones and Hinton. Most people don’t know where their water comes from or where it goes after it runs down the drain. That’s according to a study researchers at Indiana University recently published in the academic journal Judgment and Decision Making. The team asked 500 students to draw a diagram depicting the journey water takes as it reaches the tap and returns to the environment. They compared these to diagrams drawn by experts. Most students omitted significant stages: 64 percent didn’t depict a wastewater plant; 29 percent did not include a water treatment plant. 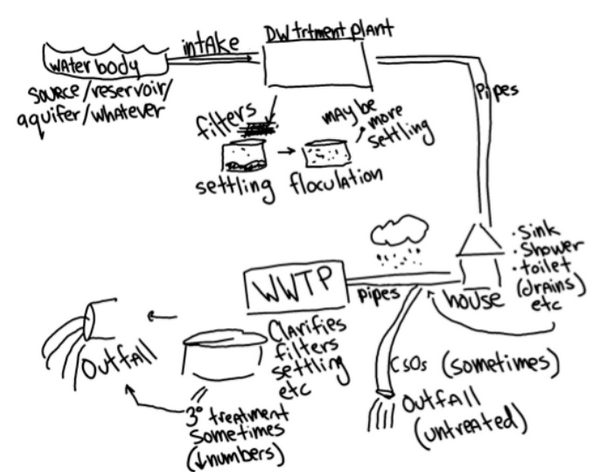 Only 7 percent of the student diagrams included all seven categories of the water cycle — source, treatment, distribution, household use, collection, wastewater treatment and environmental return. 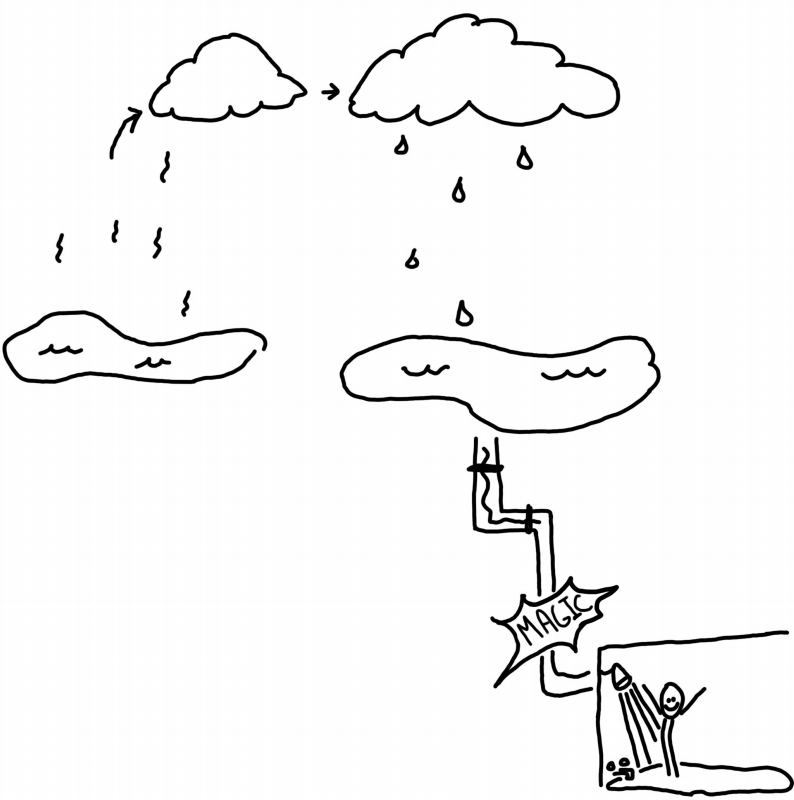 Researchers compared the student diagrams to this one, drawn by an expert. Image: Attari, Poinsatte-Jones and Hinton. Students in environment-related programs fared better. They also tended to be more concerned when asked about their perceptions of water risks. The lack of such basic knowledge is troublesome, especially when policymakers are confronted with the need to invest in the decaying infrastructure that delivers and treats water, the researchers said. Communicating potential risks related to the water system is more difficult when dealing with people who don’t understand the source of their own water, said Shahzeen Attari, the lead author on the study. There are risks to water quality, quantity and infrastructure, she said. Misperceptions have to be corrected before the public can be convinced to spend money for maintenance and upgrades. The American Society of Civil Engineers gave the U.S. drinking water infrastructure a “D” this year, a slight improvement on the “D-” given in 2009. It claims a $105 billion investment is needed to upgrade the nation’s water and wastewater systems. And that investment gap will have to come from the public’s pocket, said Tracy Mehan, executive director of governmental affairs with the American Water Works Association. Water infrastructure has been underfunded for 50 years, he said. Now the country is seeing rising water rates as utilities grasp at funds for upgrades. That’s why more utilities are engaging in civic education programs as they try to convince the public that the rate hikes are necessary. “A lot of people think, you know, God gave us the water, why do I have to pay for it?” said Mehan, who once headed Michigan’s Office of the Great Lakes under former Gov. John Engler. That’s because people think of water as a commodity rather than a service, he said. They don’t understand how technical, sophisticated and “capital-intensive” it is to process drinking and wastewater. As for the hoped-for large infusion of federal dollars promised by President Donald Trump for infrastructural improvements, Mehan said, we’re still in the stage of great hopes but not yet into any concrete plan. 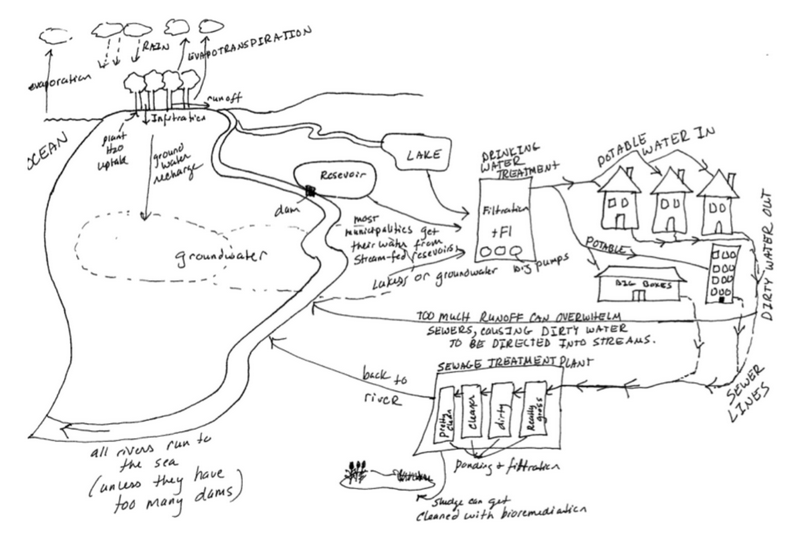 While this diagram includes one treatment plant, it also depicts untreated water running into the home being returned to the environment. Image: Attari, Poinsatte-Jones and Hinton. If rates must increase, you have to find ways to provide for lower-income communities, he said. That could mean assistance programs, block rates or higher bills for other payers. It’s easy to say that the money for infrastructural upgrades has to come from the public, said Rachel Fedewa, executive director of the Flint River Watershed Coalition. It’s another to ask a person barely scraping by to pay more for something they need to use every day. “You can’t live without water,” said Fedewa, who lives in Flint where residents still break out in rashes years after a lead contamination crisis there raised alarms about water systems across the country. Flint’s conundrum is made worse by a water system built to support a population twice the size it is today. Flint residents have been paying high water bills for years before the crisis, she said. Her relatives in Arizona have a water bill one-third the size of her own. Such challenges make it all the more important that the public understands how water works, experts say. Since all of the data was collected from students at the same university, results were not diverse in age and geographical location, and less representative of the U.S. population as a whole, Attari said. A small number of students displayed more intricate knowledge of the water system. Image: Attari, Poinsatte-Jones and Hinton. While students may be educated, they’re unlikely to have much hands-on experience with water systems, she said. They also wouldn’t tend to have strong feelings one way or another about their water supply. “I do think it would be more accurate if we went to a place where people had suffered some sort of water risk,” she said. That was true in Flint, Fedewa said. The average Flint resident knows more about the water system–and where it can go wrong–than anywhere else in the country, she said. Whether that creates longterm awareness is another question. “Right after a national story or an outbreak in your community, people learn about it and retain it, but we don’t know for how long,” said Joan Rose, a Michigan State University professor and an international expert on water quality. Some stop paying attention as soon as the issue is resolved, she said, but some retain the information they’ve learned and act on it. Milwaukee experienced a major bacterial outbreak in 1993. About 400,000 people, 25 percent of the city’s population, were affected by the disease, which caused 69 people to die and afflicted many others with diarrhea. Many years later, Milwaukee citizens are still “savvy” when it comes to their water, Rose said. The infrastructural knowledge study took some inspiration from a paper published in 2002 by John Sterman of the Massachusetts Institute of Technology, Attari said. Sterman’s study examined public knowledge of the role of greenhouse gases in global warming. He found that many people misunderstood it. The majority of respondents–and 64 percent of undergraduates at the Massachusetts Institute of Technology and 79 percent of MBA students at the University of Chicago–failed to recognize that global temperature would continue to rise for several decades even if emissions were zeroed out immediately. Like a former president once said: its not cool to not know what you’re talking about.